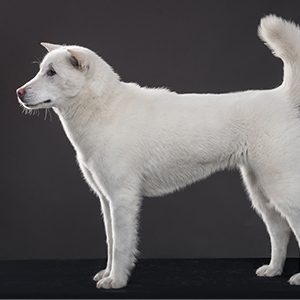 The Kishu Ken like the Kai Ken originated from medium-sized dogs in Japan during ancient times, and became established as a breed in the mountain districts of Kishu. 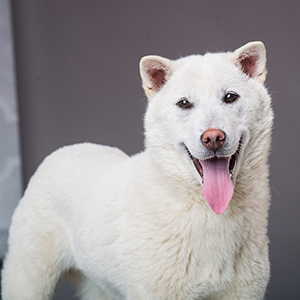 This breed is quite similar to the Hokkaido, Shikoku and the noted Kai Ken and is sometimes it is mistaken for the white variant of Hokkaido because of their extremely similar appearance. 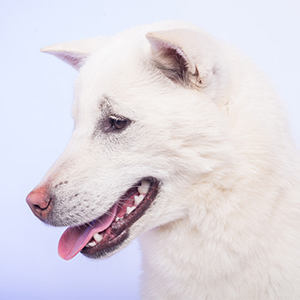 Initially the breed standard allowed for various markings on a white coat color, but in 1934 is was established that only a solid color would be accepted. As with their fellow breeds mentioned above, the Kisu Ken was used for hunting wild boar, deer, and smaller mammals. They are considered a rare breed even in Japan and to commemorate this, they were designated as a Natural Monument (protected species) in 1934. 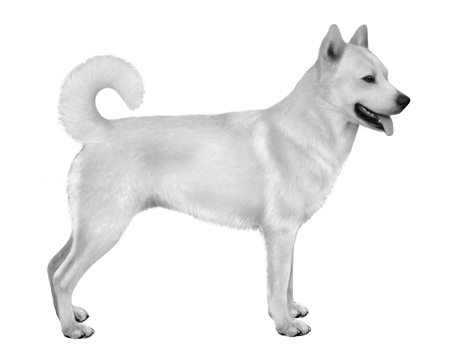 Their short white, red, or sesame-colored coats are thick and harsh with a soft and dense undercoat. Like many of the other hunting breeds from Japan with this same heritage, they feature prick, or upright ears, a narrower muzzle and a curled, or sickle-shape tail.